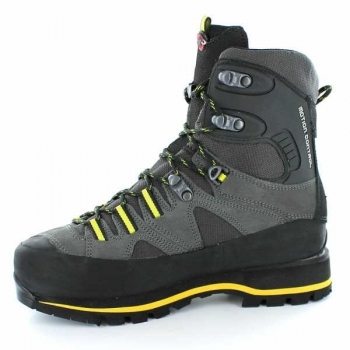 I purchased these boots for Mt. Rainier climb and winter scrambles around Washington State. I was surprised how well they fit right out of the box. I owned La Sportiva Trango boots before which were not a good fit for my medium width low volume feet and even after several years of use, they kept giving me blisters. The Monoliths soon became the boots of choice for all of my outings. After the planned Rainier climb, I took them on ample of trips, including long day hikes/snowshoe trip of up to 15 miles, scrambles both winter and summer, multi-day backpacking with load of about 25-30 lb, and a 2-week trek of Alta Via 2 route in Italy. They are stiff but extremely comfortable and provide great ankle support and stability. I tested them on variety of terrain, dirt, scree, rock, water crossings, snow both fresh and consolidated, and their performance is superb. I now have about 500 miles on them and so far they held up great. I managed to bump into a rock on a via ferrata route which chipped one of the hooks for the lace but apart of it they show a little wear and are still very waterproof.